What will LeGarrette Blount's price tag be this season? Now that the happy hangover of the Philadelphia Eagles' celebration is over, let's take a look at each position and figure out which players will be back in 2018, and which ones will be playing elsewhere. On Saturday we started with the quarterbacks. Today, we'll continue on with the running backs. In seven regular-season games with the Eagles, Ajayi had 70 carries for 408 yards (5.8 YPC) and a TD. He also chipped in 10 receptions for 91 yards and a TD. In three playoff games, Ajayi took on a somewhat bigger role, carrying 42 times for 184 yards (4.4 YPC), while catching 6 passes for 70 yards. Ajayi proved to be an explosive back that the team acquired for a measly late fourth round pick. In 2018, he'll be on the final year of his rookie deal. #JimmyVerdict: Ajayi will probably start in 2018. Jay Ajayi: Stay or Go? The Eagles signed Blount more than two months after the start of free agency last offseason at the bargain bin price of $1.25 million. While Blount was technically a starter for much of the season, he was used more like a role player, as he averaged 10.4 carries per game. In his role, Blount was very effective, carrying 173 times for 766 yards (4.4 YPC) and 2 TDs. He also rumbled for touchdowns in each of the Eagles' three playoff wins. Despite some questioning his character, Blount turned out to be a great teammate who never complained (publicly, anyway) about playing time and was genuinely liked by his teammates. 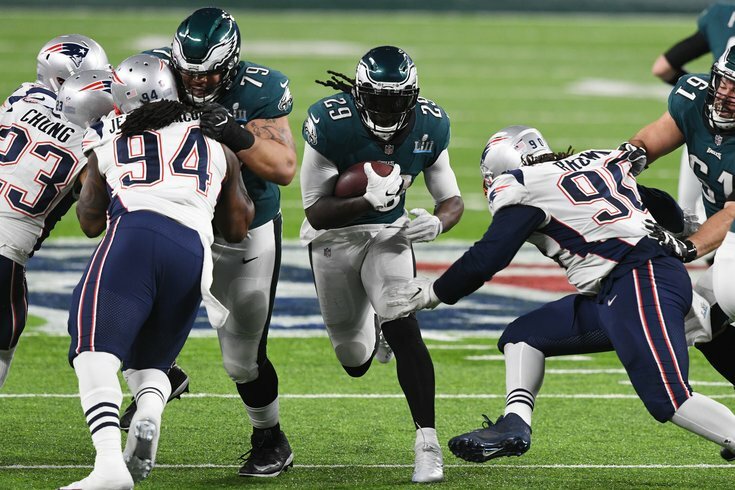 Blount will be a free agent once again this offseason, and I'd imagine that the Eagles would certainly take him back again at $1.25 million. Logic would dictate that he'd cost more than that. Then again, logic would dictate that a guy who scored 18 TDs in 2016 would've gotten more than $1.25 million in 2017, too. So who knows. The Eagles can count on Ajayi and Corey Clement in 2018, but Doug Pederson has stressed often that he likes having a robust stable of backs, because of the physical nature of the position. Blount just turned 31 in December, so he won't break the bank in free agency. He could return if the price is right. #JimmyVerdict: Tough call. I think the Eagles will wait until after the draft to decide on if they bring Blount back. If they select a running back reasonably early, I would lean against it. If not, I think they'd quickly move to re-sign him, if he hasn't already landed elsewhere. Overall, the odds seem against it. LeGarrette Blount: Stay or Go? Clement had 71 carries for 321 yards (4.3 YPC) and 4 TDs as a runner during the regular season after finding a role as the team's third-down back. He also chipped in 10 receptions for 123 yards and 2 TDs, and was surprisingly the Eagles' best running back in pass protection after Darren Sproles went down with an ACL tear. In the Super Bowl, Clement shined, as he had 100 receiving yards and made a great play on his crucial TD reception in the back of the end zone. #JimmyVerdict: There's zero question. Clement will be back. Corey Clement: Stay or Go? Previously, Sproles said that he would probably retire after the 2017 season. However, after simultaneously breaking his arm and tearing his ACL on the same play early this season, Sproles may not want to go out like that. Heading into the 2018 offseason, Sproles is a free agent. He turns 35 in June and is still rehabbing his knee. The Eagles (as well as other teams around the league) will have to decide how much elusiveness Sproles will have left, considering those two factors. #JimmyVerdict: With the Eagles tight against the cap, and Sproles unlikely to play for a veteran minimum type of deal, he'll probably be serving as a veteran presence elsewhere in 2018. Darren Sproles: Stay or Go? Ah, the curious case of Wendell Smallwood. Many have wondered why Smallwood fell so far down the depth chart, to the point where he was a regular on the inactive list down the stretch. I think it's fairly simple. He wasn't as good a runner as Ajayi or Blount, and not as effective as a receiver or in pass protection as Clement. That's all. #JimmyVerdict: I don't know that the team has shut the door on Smallwood completely yet. He'll be back in training camp next year, with an opportunity to make the team, and he'll benefit if Blount is snapped up by some other team. Still, I'd lean toward him not making the 53-man roster if we're projecting that far ahead. Wendell Smallwood: Stay or Go? Remember Pump? He's still around. Heading into the OTAs and minicamp, the Eagles had high hopes for Pumphrey as a guy who could be a dynamic player, creating mismatches in the slot, being a shifty, elusive runner out of the backfield, and getting work as a returner. It didn't quite pan out that way. Pumphrey made the team in 2017 because he was a fourth-round pick. He certainly didn't make it on the way he played in training camp or the preseason games. Very early in the season, Pumphrey went on IR with a hangnail and wasn't heard from again. #JimmyVerdict: Like Smallwood, Pumphrey will be in camp in 2018, where he'll have an opportunity to make the team. Both he and Smallwood will be sweating out the draft, hoping the Eagles don't take another running back to add to their competition. Pumphrey will have to show way more than he did in 2017 to make the team in 2018. Like Smallwood, I'll lean against it. Donnel Pumphrey: Stay or Go? The Eagles were fortunate that Barner was on the street looking for a job when they signed him to return kicks and punts after Sproles went down for the season, but he's a player they should look to upgrade this offseason. In 2017, Barner averaged 19.4 yards per kick return (not good) and 8.9 yards per punt return (OK). He had three fumbles/muffs on returns, which is obviously not good. #JimmyVerdict: Barner provided (in my opinion) the best celebration of the season when he cracked the safe and made it rain in Dallas, but the Eagles should make the returner position a priority this offseason. Kenjon Barner: Stay or Go?